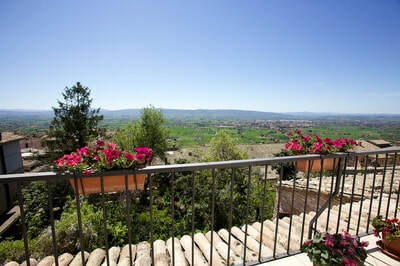 We currently offer six day ~ five night meditation retreats in the peace of Assisi. Your retreat includes a guided pilgrimage to the sacred sites of this ancient hilltop town. Guests of all traditions are welcome. We are cultivating inner peace and gentleness. Each guest can have a private room and bathroom. 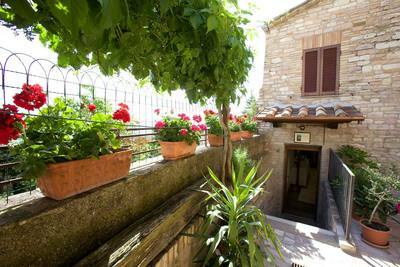 We stay in the Center of the old city in a family run Pensione. Our retreats begin with morning meditation. We meet 2-3 times each day to reflect on the special peace of Assisi, how it touches our hearts and then we visit the sacred gardens, olive groves and monasteries of ancient Assisi. For centuries people from all over the world and from all paths, have been coming to Assisi to feel the vibrant presence of St Francis and St. Clare of Assisi. 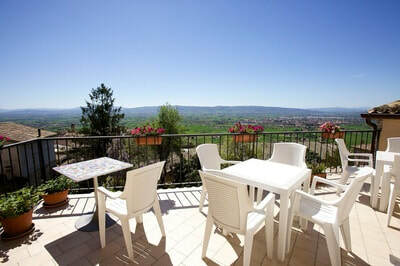 By giving oneself a retreat in the heart of ancient Assisi, we experience it's profound spirit & beauty. As we bring this into our daily practices, our contemplative journey becomes especially powerful and memorable. Spacious personal time for rest, reading, exploring the hidden treasures of the ancient hilltop town. 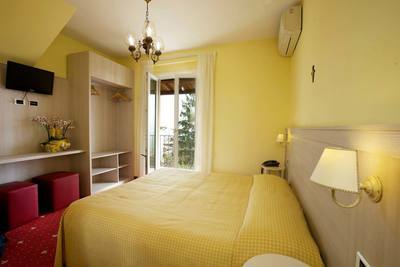 ​Each guest can have a private bedroom with en suite bathroom, all amenities. 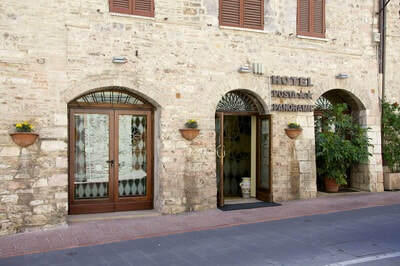 In 1999 Ruth & Bruce restored the original Courthouse of Assisi, that existing in the time of St Francis and St Clare, into a Peace Center for the World Religions. Turning a room that once was a place of judgement into a place of non-judgement. It was sold in 2009 when they finished reconstruction of their retreat home in the countryside. There were altars for Christianity, Judaism, the Muslim Faith, Buddhism, Nature Religions and Hinduism. People of all traditions were welcome. Whirling dervishes, Hari Krishnas, Catholic Priests, Buddhist Rinpoches and Shamans & Priestesses all contributed their blessings and worship in the temple. Pope John Paul II, blessed our Center and its mission, in January of 2002. 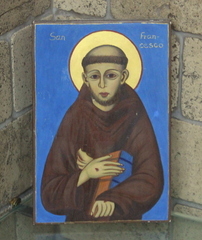 St Francis was known as the human saint and with his compassion for humanity created the Franciscan movement. He lived from 1181 - 1226 and revolutionized the Catholic church at that time. 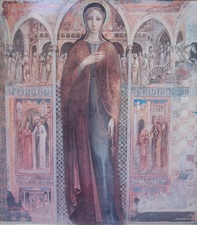 St Clare was the first woman to follow in Francis' footsteps. She left her high rank and family fortune to follow Francis in his life of humility and service. She started the first women's order in history, called the Poor Clare's. In 2002 the Davis' created this beautiful Hermitage of Simple Peace. 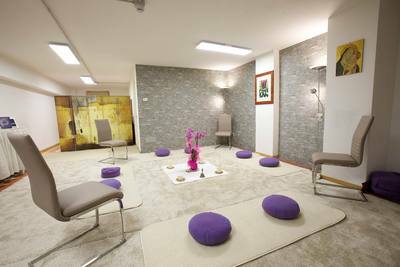 Awarded one of the top ten Retreat Centers in the world, by Travel & Leisure Magazine, in 2008 and again by CNN in 2011. It was the first Silent Stay !!! It gave us the model that we use today of simple days of silence, beauty and joy. ​We sold the Hermitage in 2016. We continue retreats now from the center of town just as we began. One of our favorite artists in Assisi is Massimo Crucciani. His glass artwork is original and unique. 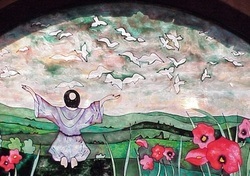 This painting was on our entry door to the Assisi Peace Center Temple. He is world renowned and has the heart to match !!! With many of his pieces shown in art galleries around the world, you will see many of his pieces here at Silent Stay. 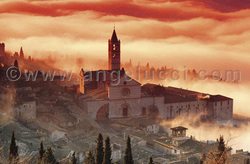 Andrea Angelucci is known as The Photographer of Assisi. A rare and talented photographer he captures the essence of Assisi in his work.